A few months ago I listened to The Secrets You Keep by Kate White which I really enjoyed. But now I'm completely head over heels for her on this one...Even if it Kills Her. Writer Bailey Weggins runs into an old college friend at a book signing, and a cold case starts to heat up. 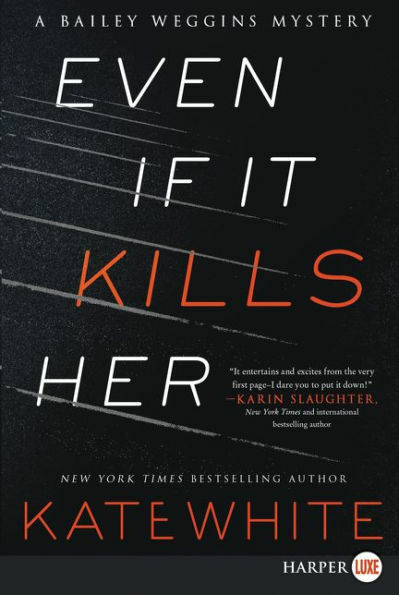 Her friend, Jillian Lowe suffered through the tragic event of losing her entire family during her sophomore year in college when they were all murdered. Fueled by a nagging guilt that she wasn't there for her friend all those years ago, Bailey reluctantly takes on the case. Now that I had the chance to focus on her, I saw that she'd been fighting time with the same determination the Ottomans had mustered during the siege on Constantinople. Her face clearly had been buffed, Botoxed, dermabrased, and Juvedermed into something that looked natural only if you were squinting at it. If you need a good suspense novel and plenty of laughter, be sure to check this one out! I did really enjoy it and now I want to read more of her books :) Thanks for introducing me to a new author.